Welcome friend! I'm SO GLAD you're hanging out with me this morning! 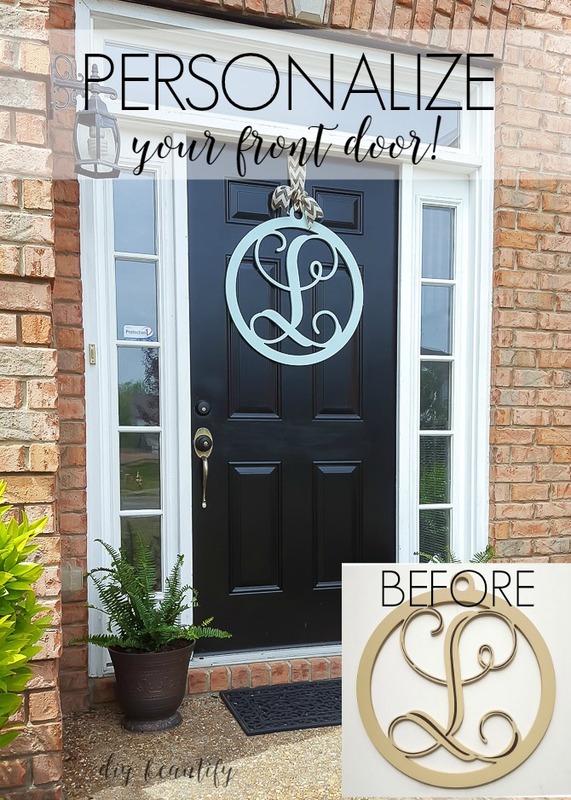 I'm sharing an easy way to personalize your front door today! I wish I could tell you that I've been busy painting a new piece of furniture, or working on a room redesign...or even pulling out all my fall decor and having at it. But instead, I'm at the beach...collecting sea glass! What started out as just a few pieces...has quickly grown to include over 150 pieces! And I'm leaving all the brown glass for someone else to collect, lol! 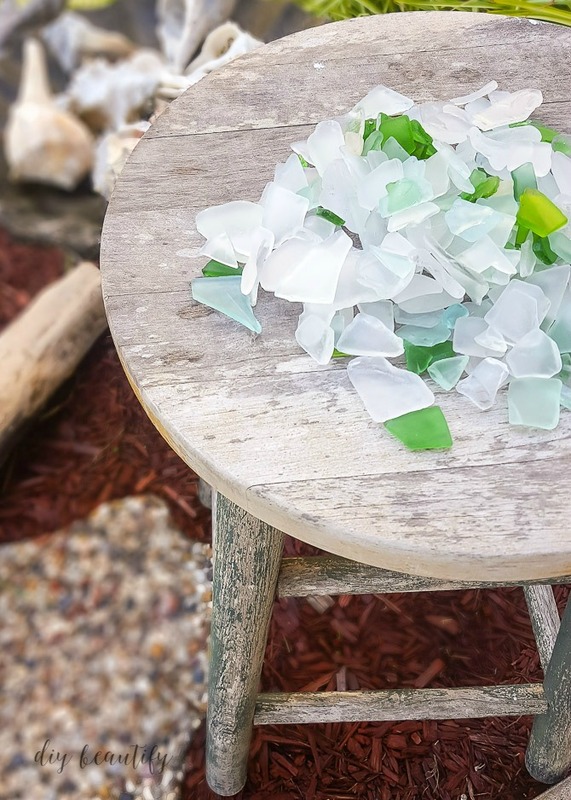 I even spent one evening sorting my sea glass by color...it's quickly becoming an addiction - at least it's a healthy one! 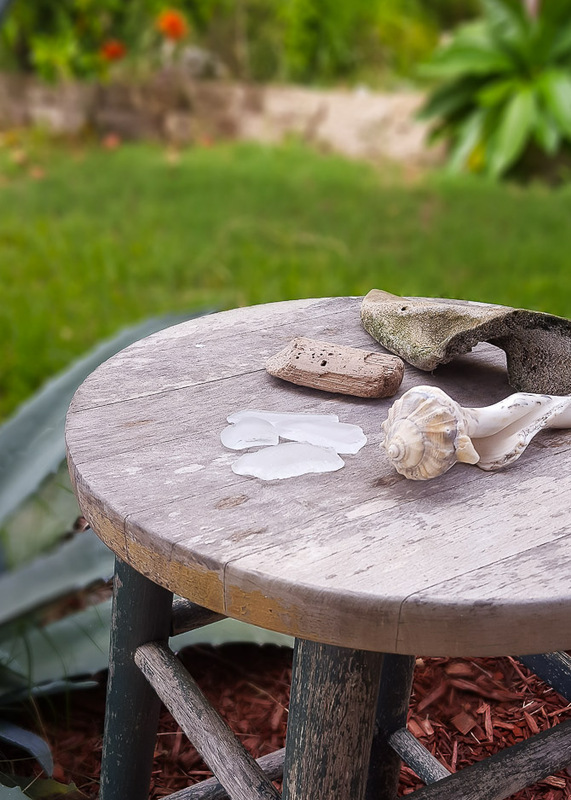 I've needed a creative outlet since moving to TX, and beach-combing seems to be it for now! Have you ever found something in the store that you really liked...except the color just wasn't you? 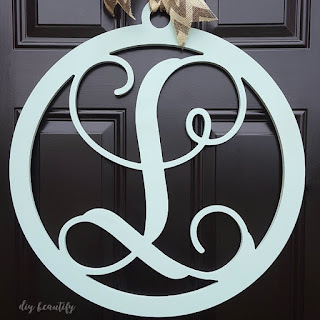 That's what happened with this large monogram door hanging I found at Carolina Pottery while visiting my in-laws in North Carolina in the spring. 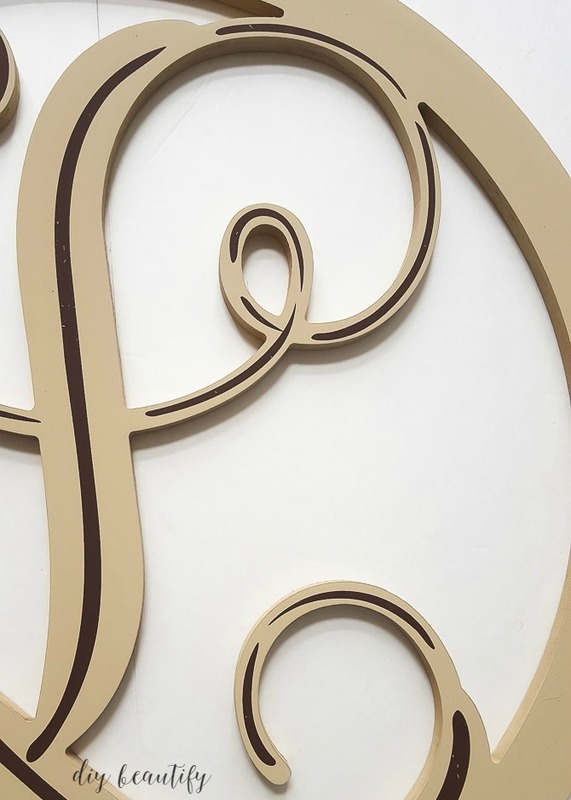 I loved the swirly monogram, and knew it would be a great way to personalize our front door. I loved every single thing about it...except the color. I couldn't get it out of my head...and in hindsight I couldn't believe that I let a simple thing like color keep me from buying something I loved. I didn't waste much time making it my own, and let it be a lesson to me that color should never stop you from purchasing something (unless it's a pair of red jeans!). Affiliate links provided for your convenience. Find my full disclosure policy here. The finish of this piece was fairly rough, which is why I chose to lightly sand it first. Then I used a damp rag to clean all the sanding dust off. And then it was a matter of spray painting...2-3 light coats is always better than one heavy one! I kept it simple without any embellishments or 'shading' like the original. I hung it from burlap ribbon that I stapled to the top of my door jamb...yes, I said stapled! That way there is no need for a cumbersome wreath hanger and the wreath stays right where I want it! I really love the pop of sea foam against my recently painted black front door! 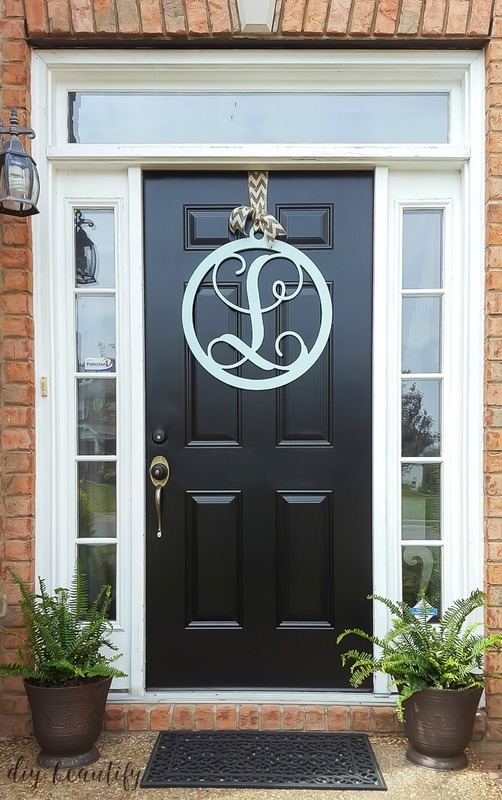 Adding some personalization to the front of your door is like a little invitation to come on in...and see what's behind that pretty door! 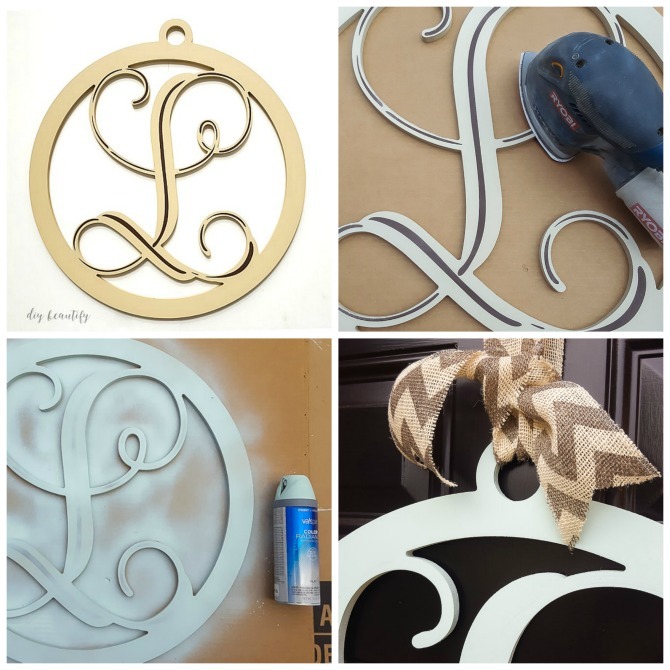 This project couldn't be simpler and the results are fantastic! So, lesson learned! Color is a quick and easy fix for almost every decor option! By personalizing this wreath with the color of my choice, it is unique and you're unlikely to find one just like it in the same color! Have you ever walked away from something you really liked because the color was wrong? Alright, I'm off to the beach...gotta find more beach glass! Stunning addition and I love the black door. How simple and elegant. I love it! 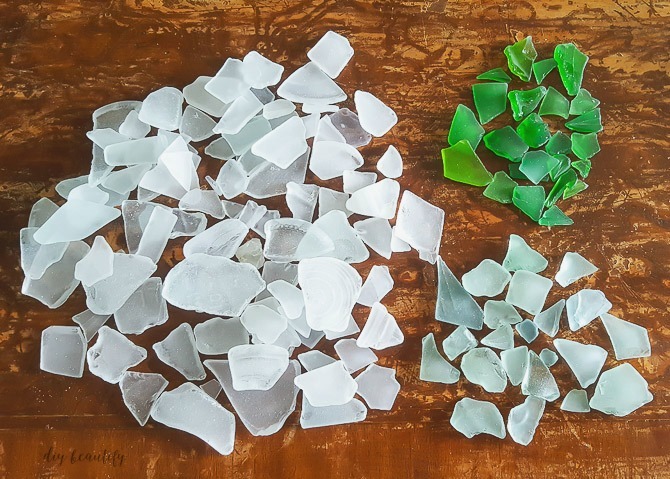 I just sorted some of my beach/sea glass early this evening from my recent trip home to Michigan! I picked up pieces from Lake Michigan and Lake Huron. It is a wonderful addiction to have! You got some great pieces! Thanks so much Michele! I'm glad to hear that I'm not the only one with this addiction lol ☺ I have plans for some of my pieces,so stay tuned. Absolutely gorgeous. Thanks for the inspiration.